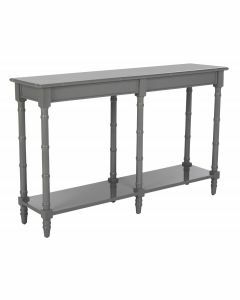 The Charleston console table reflects the art of contemporary discernment, bringing a glamourous layer of luxury to any interior. Its slender acrylic legs and glass top are elegantly juxtaposed with the chrome finish on its stainless steel frame. This table measures 66" W x 18.25" D x 32" H. Click on images for greater detail. Please note this item ships via white glove residential delivery.